Any magic or circus-style show worth its salt will always have a big finish to send audiences off with a spring in their step. 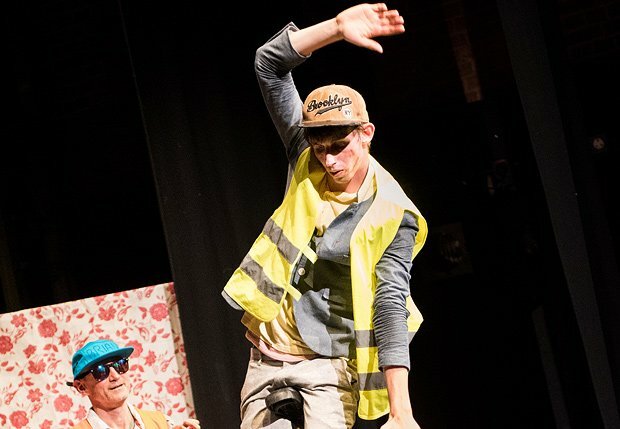 Sam Goodburn's grand finale is entirely neutered by him spending a few minutes hunting high and low around his stage for a piece of equipment that will assist him in his dramatic climax of journeying on his unicycle across a line of beer bottles. In the end, he needs to bring on a couple of audience members to help out and when it works on the third time of asking, the huge cheer that results is one of intense relief rather than anything close to a victory salute. Perhaps the lesson that Goodburn might learn from this near-catastrophe is not to clutter the stage with so many knick-knacks and doofers that might hide a vital prop. The narrative framework he's settled upon for Dumbstruck (in another misstep, he does actually talk during the show) is having his character find himself at a girl's messy flat the morning after a passionate night before. Simple tasks such as making her breakfast elude him and, on too many occasions, rudimentary juggling also seems beyond his ability. Given that he was awarded a new circus act award in 2015, it's fair to suggest that this might have been an off-day, but with one shot to woo an audience, Goodburn fell at the most basic hurdles.